As a young researcher, just starting out, something happened that changed my life. I was obsessed with understanding how people cope with failures, and I decided to study it by watching how students grapple with hard problems. So I brought children one at a time to a room in their school, made them comfortable, and then gave them a series of puzzles to solve. The first ones were fairly easy, but the next ones were hard. As the students grunted, perspired, and toiled, I watched their strategies and probed what they were thinking and feeling. I expected differences among children in how they coped with the difficulty, but I saw something I never expected. Everyone has a role model, someone who pointed the way at a critical moment in their lives. These children were my role models. They obviously knew something I didn’t and I was determined to figure it out—to understand the kind of mindset that could turn a failure into a gift. What did they know? They knew that human qualities, such as intellectual skills, could be cultivated through effort. And that’s what they were doing—getting smarter. Not only weren’t they discouraged by failure, they didn’t even think they were failing. They thought they were learning. I, on the other hand, thought human qualities were carved in stone. You were smart or you weren’t, and failure meant you weren’t. It was that simple. If you could arrange successes and avoid failures (at all costs), you could stay smart. Struggles, mistakes, perseverance were just not part of this picture. Whether human qualities are things that can be cultivated or things that are carved in stone is an old issue. What these beliefs mean for you is a new one: What are the consequences of thinking that your intelligence or personality is something you can develop, as opposed to something that is a fixed, deep-seated trait? Let’s first look in on the age-old, fiercely waged debate about human nature and then return to the question of what these beliefs mean for you. Since the dawn of time, people have thought differently, acted differently, and fared differently from each other. It was guaranteed that someone would ask the question of why people differed—why some people are smarter or more moral—and whether there was something that made them permanently different. Experts lined up on both sides. Some claimed that there was a strong physical basis for these differences, making them unavoidable and unalterable. Through the ages, these alleged physical differences have included bumps on the skull (phrenology), the size and shape of the skull (craniology), and, today, genes. A few modern philosophers . . . assert that an individual’s intelligence is a fixed quantity, a quantity which cannot be increased. We must protest and react against this brutal pessimism. . . . With practice, training, and above all, method, we manage to increase our attention, our memory, our judgment and literally to become more intelligent than we were before. Who’s right? Today most experts agree that it’s not either–or. It’s not nature or nurture, genes or environment. From conception on, there’s a constant give and take between the two. In fact, as Gilbert Gottlieb, an eminent neuroscientist, put it, not only do genes and environment cooperate as we develop, but genes require input from the environment to work properly. At the same time, scientists are learning that people have more capacity for lifelong learning and brain development than they ever thought. Of course, each person has a unique genetic endowment. People may start with different temperaments and different aptitudes, but it is clear that experience, training, and personal effort take them the rest of the way. Robert Sternberg, the present-day guru of intelligence, writes that the major factor in whether people achieve expertise “is not some fixed prior ability, but purposeful engagement.” Or, as his forerunner Binet recognized, it’s not always the people who start out the smartest who end up the smartest. It’s one thing to have pundits spouting their opinions about scientific issues. It’s another thing to understand how these views apply to you. For twenty years, my research has shown that the view you adopt for yourself profoundly affects the way you lead your life. It can determine whether you become the person you want to be and whether you accomplish the things you value. How does this happen? How can a simple belief have the power to transform your psychology and, as a result, your life? Believing that your qualities are carved in stone—the fixed mindset—creates an urgency to prove yourself over and over. If you have only a certain amount of intelligence, a certain personality, and a certain moral character—well, then you’d better prove that you have a healthy dose of them. It simply wouldn’t do to look or feel deficient in these most basic characteristics. Some of us are trained in this mindset from an early age. Even as a child, I was focused on being smart, but the fixed mindset was really stamped in by Mrs. Wilson, my sixth-grade teacher. Unlike Alfred Binet, she believed that people’s IQ scores told the whole story of who they were. We were seated around the room in IQ order, and only the highest-IQ students could be trusted to carry the flag, clap the erasers, or take a note to the principal. Aside from the daily stomachaches she provoked with her judgmental stance, she was creating a mindset in which everyone in the class had one consuming goal—look smart, don’t look dumb. Who cared about or enjoyed learning when our whole being was at stake every time she gave us a test or called on us in class? I’ve seen so many people with this one consuming goal of proving themselves—in the classroom, in their careers, and in their relationships. Every situation calls for a confirmation of their intelligence, personality, or character. Every situation is evaluated: Will I succeed or fail? Will I look smart or dumb? Will I be accepted or rejected? Will I feel like a winner or a loser? But doesn’t our society value intelligence, personality, and character? Isn’t it normal to want these traits? Yes, but . . .
There’s another mindset in which these traits are not simply a hand you’re dealt and have to live with, always trying to convince yourself and others that you have a royal flush when you’re secretly worried it’s a pair of tens. In this mindset, the hand you’re dealt is just the starting point for development. This growth mindset is based on the belief that your basic qualities are things you can cultivate through your efforts. Although people may differ in every which way—in their initial talents and aptitudes, interests, or temperaments—everyone can change and grow through application and experience. Did you know that Darwin and Tolstoy were considered ordinary children? That Ben Hogan, one of the greatest golfers of all time, was completely uncoordinated and graceless as a child? That the photographer Cindy Sherman, who has been on virtually every list of the most important artists of the twentieth century, failed her first photography course? That Geraldine Page, one of our greatest actresses, was advised to give it up for lack of talent? You can see how the belief that cherished qualities can be developed creates a passion for learning. Why waste time proving over and over how great you are, when you could be getting better? Why hide deficiencies instead of overcoming them? Why look for friends or partners who will just shore up your self-esteem instead of ones who will also challenge you to grow? And why seek out the tried and true, instead of experiences that will stretch you? The passion for stretching yourself and sticking to it, even (or especially) when it’s not going well, is the hallmark of the growth mindset. This is the mindset that allows people to thrive during some of the most challenging times in their lives. One day, you go to a class that is really important to you and that you like a lot. The professor returns the midterm papers to the class. You got a C+. You’re very disappointed. That evening on the way back to your home, you find that you’ve gotten a parking ticket. Being really frustrated, you call your best friend to share your experience but are sort of brushed off. What would you think? What would you feel? What would you do? 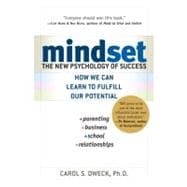 When I asked people with the fixed mindset, this is what they said: “I’d feel like a reject.” “I’m a total failure.” “I’m an idiot.” “I’m a loser.” “I’d feel worthless and dumb—everyone’s better than me.” “I’m slime.” In other words, they’d see what happened as a direct measure of their competence and worth. Excuse me, was there death and destruction, or just a grade, a ticket, and a bad phone call? Are these just people with low self-esteem? Or card-carrying pessimists? No. When they aren’t coping with failure, they feel just as worthy and optimistic—and bright and attractive—as people with the growth mindset. What is there to do! You know, when I wrote the vignette, I intentionally made the grade a C+, not an F. It was a midterm rather than a final. It was a parking ticket, not a car wreck. They were “sort of brushed off,” not rejected outright. Nothing catastrophic or irreversible happened. Yet from this raw material the fixed mindset created the feeling of utter failure and paralysis. There were many, many more like this, but I think you get the idea. Now, how would they cope? Directly. You don’t have to have one mindset or the other to be upset. Who wouldn’t be? Things like a poor grade or a rebuff from a friend or loved one—these are not fun events. No one was smacking their lips with relish. Yet those people with the growth mindset were not labeling themselves and throwing up their hands. Even though they felt distressed, they were ready to take the risks, confront the challenges, and keep working at them. Is this such a novel idea? We have lots of sayings that stress the importance of risk and the power of persistence, such as “Nothing ventured, nothing gained” and “If at first you don’t succeed, try, try again” or “Rome wasn’t built in a day.” (By the way, I was delighted to learn that the Italians have the same expression.) What is truly amazing is that people with the fixed mindset would not agree. For them, it’s “Nothing ventured, nothing lost.” “If at first you don’t succeed, you probably don’t have the ability.” “If Rome wasn’t built in a day, maybe it wasn’t meant to be.” In other words, risk and effort are two things that might reveal your inadequacies and show that you were not up to the task. In fact, it’s startling to see the degree to which people with the fixed mindset do not believe in effort.